In the first class we each got two ~400 yard skeins of so-called sock-weight superwash merino yarn. Merino is the sheep breed, and they are known for their fine, soft wool. Superwash is a processing technique that makes the yarn less likely to shrink or pill, so the yarn is delightfully soft and about bulletproof. 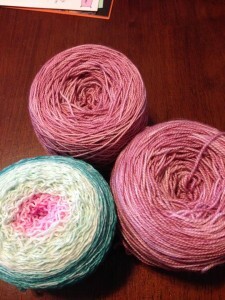 The yarn was in a plastic bag, still wet with a citric acid solution in which they were pre-soaked. I was completely winging it, and mixed two parts of fire-engine red, one part of sunflower yellow, and got this horribly blinding orange, which is not where I wanted to go. I added one part of black, which toned it all down to a nice rose color. I dyed both skeins the same – dipping one-third into the dye bath for a while, then another third for a while, and then the rest of the skein for a while, all roughly ten-minute steps. 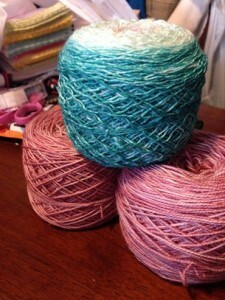 I then squeezed the bulk of the dye out of the yarn and stashed it in a plastic bag. Done with Lesson One. This was written by admin. Posted on Tuesday, March 22, 2016, at 12:22 pm. Filed under Spinning and weaving, Uncategorized. Bookmark the permalink. Follow comments here with the RSS feed. Post a comment or leave a trackback.